2014 was a banner year for Yellow-throated Warbler sightings in Morris and especially Somerset. The spring of 2015 is off to a promising start, as well. 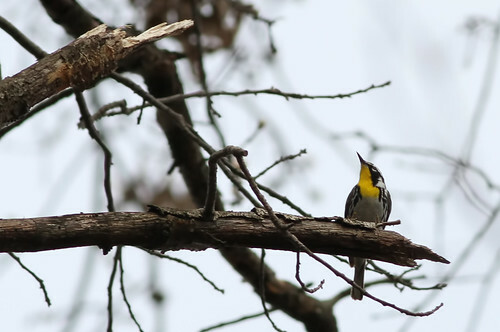 A Yellow-throated Warbler was found this morning at Glenhurst Meadows by Rob Gallucci and MacKay James and was present late in the afternoon. It favors the trees bordering Cory Brook heading north towards the ponds. It kept company with a group of Palm, Yellow-rumped and Pine Warblers. In photographs, the individual appears to have a hint of a yellow supercilium before the eye, plus no white on the chin. Observers might think this is enough to label this individual as Setophaga dominca dominica, the “coastal” Yellow-throated Warbler rather than the typically white-lored S. d. albilora, the “Sycamore Warbler”. The bill, on the other hand, seems small for a typical dominica and more in the range of S. d. albilora. Dunn and Garrett’s Warblers (Dunn, J. L., and K. L. Garrett. 1997. A Field Guide to Warblers of North America. Houghton Mifflin, New York) says the following: S. d. albilora is distinguished from S. d. dominica by its smaller bill (bill size is consistent throughout its range). The account goes on to say that while S. d. albilora have a white, rather than yellow, supraloral stripe, many have a yellow tinge to the area and some S. d. dominica appear almost whitish there. Furthermore, most, but not all, albilora show some white on the extreme upper chin. Is there one feature that determines subspecies in this case? Apparently not. This individual could go either way depending on how much weight one puts on the specific characteristics. Yellow-throated Warbler, Setophaga dominca, works for this observer. As far as is known, this is a first record for Glenhurst Meadows. Jonathan thanks for the info. 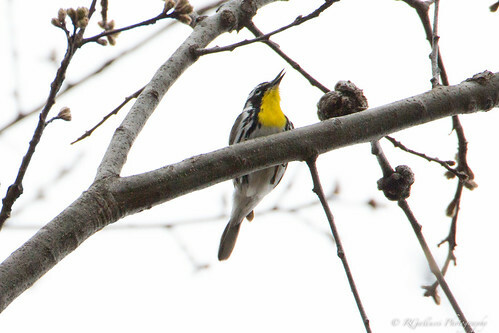 re: ID of the two subspecies of Yellow-throated Warbler.Good stuff!